Description: Multi-talented, delightfully charming Anne Bisson is back with another gem! One of the most beautiful female voices in jazz! 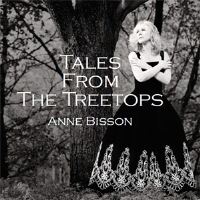 Pianist and vocalist Anne Bisson is joined by drummer Paul Brochu, bassist Frederic Alarie, and cellist Vincent Belanger for Tales From the Treetops, her follow-up to Blue Mind. All but one of the songs are performed in English. Anne also performs a duet with special guest international soprano Suzie LeBlanc. The vinyl LP edition is available here. Recorded live at Les Studios Opus, L'Assomption, Quebec, Canada, in December 2013.